October 12 through October 15, New York saw the latest bridal collection for fall season 2013. 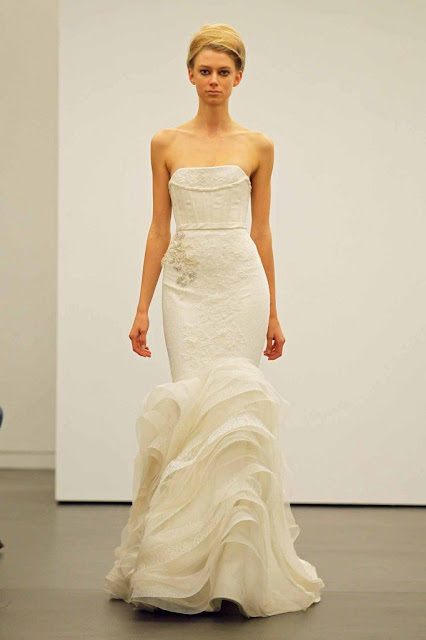 Vera Wang's fall 2013 bridal collection was the week's surprise. After two collections full of color, Vera Wang surprised with only white wedding dresses. According to Vera Wang, "the 2013 Fall Bridal Collection reflects an exploration of laces all handwrought, pieced, appliqued and tossed onto an assortment of light, airy confections with a casual nonchalance". "This study in femininity and romance celebrates the wedding gown in a new take on classicism and ornamentation"